Spread the chores throughout the week. Accomplishing a list of tasks can be overwhelming if you attempt to tackle them all at once. That said; spread out your cleaning chores throughout the week and assign a family member for each task. For instance, you can be in charge of the dishes; your spouse of taking out the trash; and the kids can handle the laundry or sweeping the floors. Set up a family meeting and discuss who will take over which chore. Play a game. For instance, the entire family can get together and you can have a race based on who is able to collect the most number of trash bins in the house in the shortest amount of time. Make sure to have great prizes prepared so that everybody is motivated to up their game and get competitive! Invest in an iPod. Everything is more fun when there’s good music playing in the background, isn’t it? No matter what cleaning chore or task your family is in the middle of, everyone is certain to have a more enjoyable time if there’s fun music blaring in the house! Praise your child after each successfully accomplished task. 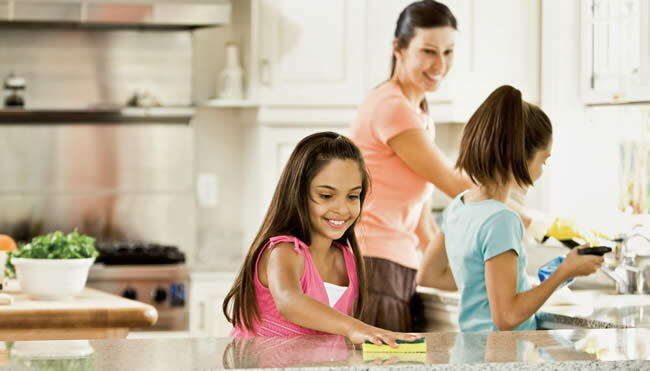 While it can be tempting to think that doing cleaning chores is a menial task, it can actually serve as a great medium to teach your child about perseverance and excellence. After each cleaning task has been accomplished, be sure to let your child know how proud you are of them and how well they’ve done their task. This will instill them a sense of fulfillment and pride that they are sure to cherish. It will also build their self-esteem.